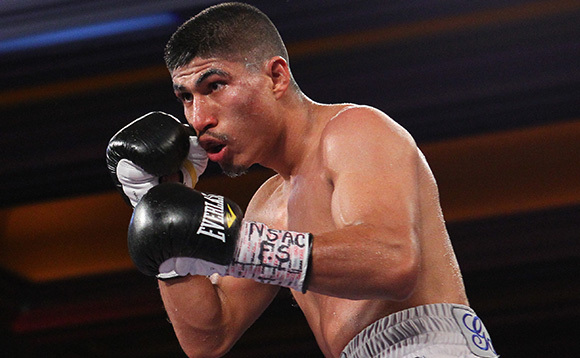 On February 10, undefeated three-division world champion Mikey Garcia will travel to the Alamodome in San Antonio, Texas to face off with IBF junior welterweight champion Sergey Lipinets. The two men went face to face with one another at a press conference inside of the Conga Room at L.A. live in Los Angeles to discuss their main event, set to be televised live on SHOWTIME and to be presented by Premier Boxing Champions. Garcia is looking to become only the third fighter in modern history to become a champion at 126, 130, 135, and 140 pounds. The only two other men to accomplish that feat are eight-division world champion Manny Pacquiao and Mexican legend Juan Manuel Marquez. Garcia is still a champion, holding the WBC lightweight belt at 135 pounds, yet explains why he wasn’t interested in a defense of his belt. In his last bout, on July 29, Garcia (37-0, 30 KO’s) defeated another four-division champion in Adrien Broner, who he beat over twelve rounds inside of the Barclays Center in Brooklyn, New York. Garcia reveals why it’s so important for him to capture that coveted title in a fourth weight class. “To win a world title in a fourth division is a big deal to me,” Garcia explained. “My dad always wanted a three-division world champion, and now I have a chance to give him a fourth title. That’s something that really excites me. Garcia, who was originally promoted by Top Rank, severed ties with the company after a dispute that cost him a few years of his career. While on the sidelines, Garcia took time to evaluate his career, and has been on fire since his return. “It’s been a great return to boxing since my layoff,” said Garcia. “When I came back, I wanted to move fast and take on big challenges. That’s what we’ve been doing so far. I want to take on any challenges that people think I can’t achieve. I think slowly we’re proving to everyone that I’m better than ever and I’m going to keep taking on the kinds of fights that will cement my legacy. “It would be a great accomplishment to be in the discussion with guys like Manny Pacquiao and Juan Manuel Marquez, that would be a win in itself,” Garcia added. “But it wasn’t on my mind when taking this fight. I just want to keep fighting the best out there. Lipinets is a tough, bruising fighter who has been dying for a fight on the big stage. He may be unknown to some fight fans across the world, but Garcia understands the kind of match it will be. “It’s going to be a great fight,” said Garcia. “Like I’ve said, the challenge for me is that I’ll be fighting the bigger man. On fight night, that advantage he has on me might be enough to make it that much more exciting. It will be interesting to see how well I adapt to the size. I have to make adjustments to overcome those challenges. This should give the fans the excitement that we want to give them.